There is an explosion of Type 2 Diabetes Mellitus or T2DM in Trinidad and Tobago and a few other countries in the Bahamas and Caribbean Islands such as Cuba, Haiti, Jamaica and Dominican Republic. It is now the second leading cause of death in Trinidad and Tobago or T&T. These are attributed to both genetic predispositions and sedentary lifestyle. 415 million people have diabetes in the world and more than 44.3 million people in the NAC Region; by 2040 this will rise to 60.5 million. There were 140,300 cases of diabetes in Trinidad and Tobago in 2015. Many middle and low income countries have more people under the age of 60 with diabetes compared to the world average. Meanwhile, for high-income countries, a growing population over the age of 60 makes up the largest proportion of diabetes prevalence. With the growing affluence in Trinidad and Tobago, sedentary and diet are contributing to the epidemic. 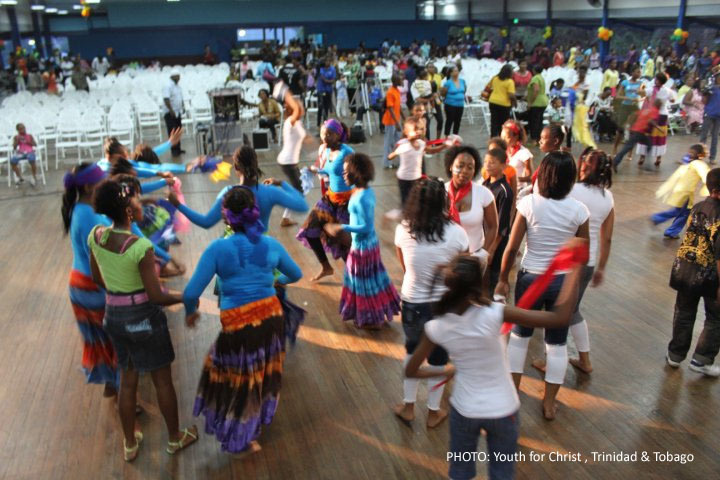 A study was conducted among primary and secondary schoolchildren in seven school districts in Trinidad in 2009. Using a ‘UriScanHurine strip’, the test generated an alarming result of T2DM prevalence. Data showed 10.4 children for every 100,000 population has diabetes. In pre-diabetes, it was 7.5 children for every 100,000 population while Type 1 Diabetes Milletus was 1.5 for every 100,000. The government sponsored test exceeds the expected worst results. The group actually hoped for finding only one positive glucose test for every 10,000 children screened, but the overall average prevalence was triple at 3.2 for every 10,000. Contrary to countries like Japan, similar screening method showed a 2.63 for every 100,000 population in the 6 to 15 years old bracket. Recognition and awareness of the problem can halt adult diabetes and demote Trinidad’s ranking as the fifth ‘fattest’ nation globally. There is an explosion of diabetes in Trinidad and Tobago and the Caribbean and it is now the second leading cause of death in T&T. Awareness that what they eat may lead to high levels of sugar, encouraging in an increase in prediabetics, is very low. Even food supplementation to arrest or control blood sugar in T&T is neither popular and a healthy lifestyle has not permeated in the society in general. Diabetes, which is now being described as an epidemic in the medical world, is also the leading cause of adult blindness in T&T. The alarming news was disclosed at a news conference at the Hyatt Regency Trinidad yesterday to launch a White Paper titled “The State of Individuals with Diabetes and their Healthcare in the South-West Region of Trinidad and Tobago”. The study found that there are shortfalls in the public health care system in the treatment of people with diabetes. Further, people with diabetes themselves have not been adequately responding to the system, it was revealed. According to the White Paper, diabetes affects an estimated 150,000 people in T&T and the numbers are growing, with 1,000 new cases every year. “T&T has been severely affected by the epidemic of diabetes. It is, arguably, among the countries with the greatest burden of this disease,” the White Paper report. 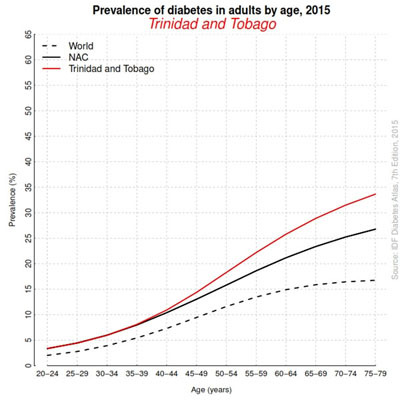 The numbers affected with the T2DM disease in Trinidad and Tobago represent an adult diabetes prevalence of 12-13%. According to Dr Claude Khan, president of the Academy of Diabetes Clinicians of T&T, who spoke at the conference in Port of Spain in 2012. The president of the Academy of Diabetes Clinicians of T&T further said in the conference that the alarming figures in T&T triple those in the United Kingdom and almost double those in the United States. It was also noted with great importance that diabetes is also the leading cause of adult blindness in Trinidad and Tobago. Alarming figures in T&T triple those in the United Kingdom and almost double those in the United States. It was also noted with great importance that diabetes is also the leading cause of adult blindness in Trinidad and Tobago. “Reasons for the high prevalence of diabetes in T&T include the genetic predispositions of its predominant ethnic groups, as individuals of both East Indian and African descent are known to have high rates of diabetes,” according to the research. Other important factors contributing to the high prevalence of the disease in T&T are increased calorie intake and more sedentary behaviour which comes with increasing affluence, the study stated. Consolidating several research and statistics, it appears that the death by Diabetis complication should pose an alarm, specially to parents who have prediabetic children. 1. Adapt a daily diet that incorporates high fiber and vegetable dishes. 2. Let the children, specially the teens to join sports activities in school. 3. Take a natural food supplement that helps control blood sugar.